Google News can be a great way to get your news, this tutorial will show you how to customize google news page so you get only the news that you want. 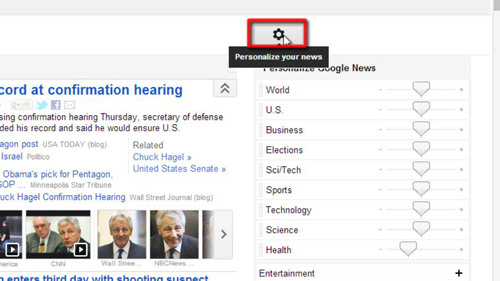 Visit “www.news.google.com” and make sure that you are logged into your Google account. You will see some of the latest news from several sources, covering a wide range of topics. To customize your news feed click the icon that looks like a cog in the top right corner of the page. A box will load to the right of the screen with many options. First let’s personalize the type of news we get. You can do this by dragging the sliders to different settings depending on how much news of that nature you want to receive. For example here we are setting world news to “Always” and business news to “Rarely”. If you want to completely eliminate one type of news click the trash can icon that appears when you hover over a section. You can also customize the sources of your news. 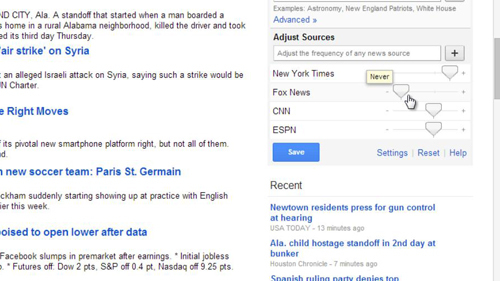 Scroll down on the page to the “Adjust Sources” section, just as before you can move the sliders, here we are going to increase the amount of news we get from The New York Times and prevent any news from Fox appearing. 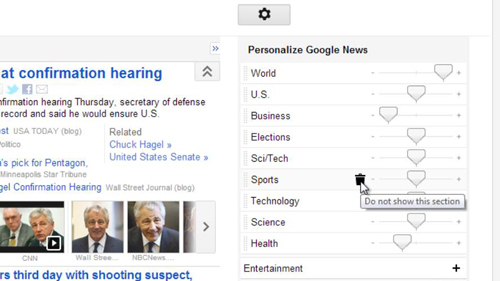 Finally, to apply these changes click “Save” and that is how to customize google news page.